The Most Revd Justin Welby, Archbishop of Canterbury, and His Excellency Mr Nasser Kamel, Ambassador of Egypt to the UK & NI, spoke at a prayer vigil alongside His Grace Bishop Angaelos, General Bishop of the Coptic Orthodox Church in the United Kingdom, at the Innocent Victims’ Memorial, Westminster Abbey. 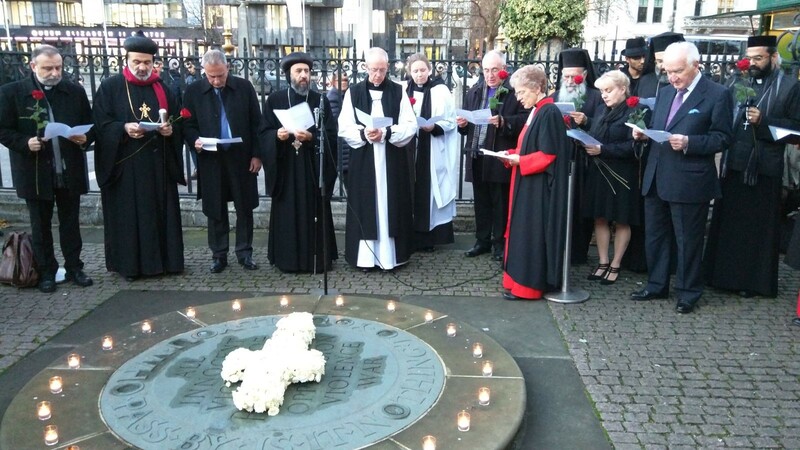 The vigil was held on 14 December 2016 in honour of the 25 Coptic Orthodox Christians, mostly women and children, who lost their lives in the recent tragic bombing of St Peter’s Coptic Orthodox Church in Cairo. Present at the memorial were various faith leaders, ambassadors, ecumenical guests, members of NGOs and the Coptic Orthodox community in the United Kingdom. The Reverend Jane Sinclair, Canon in Residence, welcomed all to the vigil, which began with a communal prayer of thanksgiving, followed by a Scripture reading, and addresses from HG Bishop Angaelos, HG The Archbishop of Canterbury and HE The Ambassador of Egypt. After the speeches there was a prayer for the departed, during which their names were read aloud as 25 red roses were laid onto the Innocent Victims’ Memorial in between 25 lit candles, representing the blood that they shed for their faith, and the light that they will continue to represent in the memory of many around the world. “It is deeply moving for myself and our community that all of you gathered here today have done so at such short notice. It is a shame that it takes events like these to gather us, but the fact that we do gather means that there is significantly greater good than evil in this world. It is tragic that families have been broken apart just before the celebration of the Feast of the Nativity, and I can only begin to imagine their sorrow. While we pray for the families and support them pastorally in whatever way we can, we know that the loss of a loved one is something that only God can truly comfort at this time through His grace. I am personally moved that my sisters and brothers, continue, despite their suffering, to live with dignity, integrity, resilience, love and forgiveness, demonstrated through their genuine Christian witness. “Despite this moment of sorrow, the people of Egypt remain united against ignorance, intolerance and extremism. These heinous crimes that aim to undermine the unity of the Egyptian people,​ regardless of their religious affiliation, ​will never succeed, ​nor will the bonds that tie its religious establishments ever be broken. Peace and harmony have always prevailed in Egypt. 0 Comment(s) to the "Press Release: Prayer Vigil for victims of Cairo Church Bombing"